Weekend run means extending my distance. Being the end of week 4, my distance was 5 miles. I tried a coule of new things. 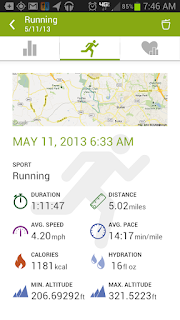 First, I set up a route with Endomondo. I did this to try and find a loop to run to get my distance in, instead of running out for 2.5 miles then turning around. It gives a good interface for building the route, allow you to snap to the roads on the map or free forming it. It will show it on the map while you run, but that's obviously not convenient. The extra bit it gives you while running is your expected finish time during the splits as well as letting you know when you've completed your goal. 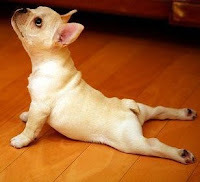 The second new thing I tried was I didn't stretch. At all. I put on my shoes, put in my headphones, started my phone and ran. That's it. The data from the studies showed decreased performance. They come down to saying that it is not known why it does but guess that stretching does what it is supposed to, loosening the muscles and tendons, which takes away their explosiveness and ability to store the energy you need. Never ignore a coincidence. Unless you're busy, in which case always ignore a coincidence. I enjoyed my run this morning. It went well, and running that kind of distance felt like another good accomplishment. 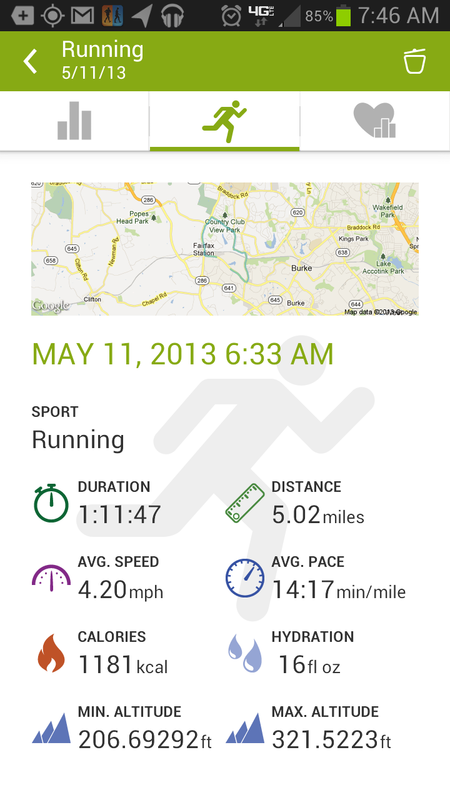 As I mentioned, I set up a route on Endomondo and used that to run. I made myself a little loop up and around. The nice thing here in northern Virginia is so much of the area has paths and sidewalks that routes are pretty easy to find. This one worked out well other than two items. First, on more than one occasion the side walk I was on just ended. Not at a corner, not at anything in particular, it would just stop. There'd be a fence or some trees or whatever, but in the middle of a block there would be no sidewalk. So I had to cut across the street on multiple occasions to get to the path available across the road. It was more an annoyance than anything. Second, during mile 3, there was a steep dip where it went down and then back up again over the course of a couple blocks that just sapped the energy out of me. It was pretty rough and took until closer to the last mile to get fully back into it and up to speed. I did finish pretty strong. In the end, I averaged 14:17 with all paces sub 15 and a fastest mile of 13:31. It was slower than the 8K, but I was still plenty happy with it. Very happy actually.